To provide the residents of Nassau County with the most cost-effective means of delivering the highest quality of medical-legal investigation into the causes and manner of deaths in Nassau County. To advance our collaborative working relationship with Nassau County’s legal and criminal justice systems and provide them with a state of the art DNA testing facility and cutting edge toxicology and histology lab services. To provide timely, thorough, and accurate scientific death investigation that will assure the public and courts that all aspects of investigation have been thoroughly reviewed, resulting in correct certification to protect the public from criminal activity, health hazards, and unsafe environments. To investigate deaths of anyone who dies in Nassau County from sudden, unexpected, suspicious, violent, unnatural, unusual or unattended death. To create the body of a decedent when an application is made for a permit. 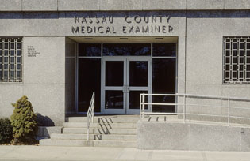 The Medical Examiner's Office is located in the town of East Meadow on the campus of Nassau University Medical Center. The Medical Examiner’s Office is staffed by a team of physicians who are board certified forensic pathologists. In addition, we have DNA, toxicology, histology scientists, forensic pathology assistants, and forensic medical investigators who are all highly trained in their unique disciplines.